Olympic champion Adam Peaty booked his passage to the Budapest World Championships with another sub-58 second time in the 100 metres breaststroke at the British Championships, then gave away his latest gold medal to a 10-year-old boy in the crowd. The 22-year-old clocked 57.79 seconds to win the British Championships in Sheffield, close to his own world record of 57.13secs, and was the only swimmer at Ponds Forge last night to automatically secure a ticket to the Worlds in Hungary later this summer. Peaty became the first British male to win a swimming gold in 28 years in 2016 and the sport’s poster boy was the star turn at the British Championships’ opening night, with one kid the lucky recipient of his medal after he picked him out in the crowd and asked if he wanted his prize. “He’s a little breaststroker I think, that’s what his mum said,” revealed Peaty, who is coached by Mel Marshall. Peaty, pictured inset, added: “I could just feel that energy down the last 50 (metres) and thought, ‘This is what we’re doing it for’. 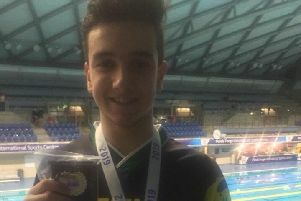 Harry Brancham, a keen club breaststroke swimmer himself with clubs in Retford and Bassetlaw in Nottinghamshire, had stayed up to watch Peaty make history in Brazil last summer and now had even more reason to feel motivated by him. “It felt inspiring,” he said of getting his medal. “I really like breaststroke and Adam Peaty inspires me to practice and keep on trying.